I’m no country music fan. Flat out. I’m not. You won’t find me line dancing* or two steppin’ my way across a dance floor (for one, I’m not coordinated enough and second, I’m just not into it). However I do appreciate good music. Which means there are some country songs I like. A couple by Carrie Underwood. One or two by Willie Nelson. The Dixie Chicks and even good ol’ Garth Brooks have some favourites of mine. A download of a country song here and there is all I need. No more. Which makes the next part of what I’m going to say seem rather juxtaposed. My company held a conference in Nashville last week. I was in Music City for four solid days. And while I didn’t get to see much of the city (because of work) I did get to go to The Grand Old Opry. That place is pretty cool. You know you need to be invited to sing there? 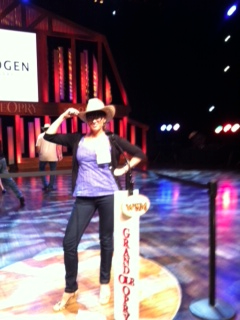 The circle of lighter wood I’m standing on is cut from the stage of the original Grand Old Opry at Ryman Auditorium. The musicians (from l. to r.: Steve Dean, Karen Staley and Billy Montana) have written songs for the likes of Waylon Jennings, Faith Hill, Garth Brooks and a bunch of other well-known country music stars whose names I do not know. The stage lights were so bright you can’t see their faces in the photo but I think the effect is kind of cool. Steve, Karen and Billy are talented and quite funny. 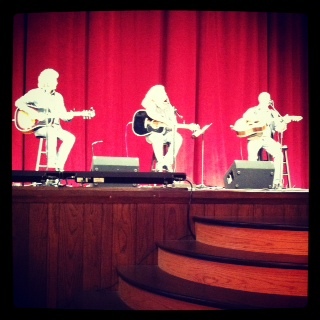 It was an intimate live music experience and I liked the songs they sang. Funny enough, I’d rather download their version of their songs than any of the big name country music stars who sing them. 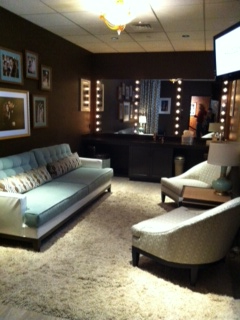 So not only did we get to listen to some great live music, we also got to tour the dressing rooms back stage. See what I mean? Totally glamorous. But in a calm way. While this was definitely an experience I wouldn’t have anticipated for myself, I really enjoyed visiting this iconic place. I may not be a country music fan in the traditional sense but I can appreciate history and talent. 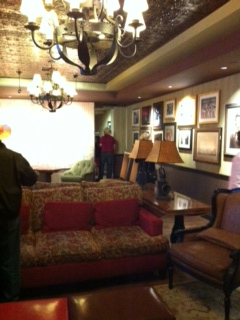 Yes, visiting the Grand Old Opry was pretty amazing. So here’s to new and unexpected experiences. I did at this event get up and line dance. Once. After all, you can’t poo-poo something if you’ve never tried it. I could only follow the steps if the dance instructor was directly in front of me. Even though it was the same series of steps, each time we switched direction I completely lost my way. Yeah…that’s how uncoordinated I am. That’s why I don’t line dance. Scoot Boot’n Boogie is a challenge for most! LOL It is the change the direction thing that does get one confused. I’m not a big old country music fan, but like you mentioned, the new country has a few that I also enjoy. I remember when DH and I took line dancing lessons and my favourite was a song called Wild Wild West. It was fun. I’m a country fan, but I would be completely out of my element within the current pop music (say like an award show) event. So I understand this. And I’m glad that you opened yourself to the experience. Thanks Alita. It was a lot of fun!